Depois de sairmos da casa de Ron and Marlys seguimos norte em direcao a fronteira com o estado de Minnesota. Este estado faz divisa com o Canada e e chamado de "Land of 10.000 Lakes" (Terra dos 10.000 lagos), na realidade sao exatamente 11.842 lagos...assim que este e "O" lugar para se pescar. Estamos em International Falls - cidade que faz divisa com a cidade de Fort Frances, em Ontario no Canada e ela e chamada de "ice box of the US" - pelas baixas temperaturas vivenciadas no inverno. Este ultimo inverno eles tiveram 85 dias com temperatura abaixo de zero Farenheit...muita neve...mas tambem pescam nesta epoca..."ice-fishing".Viemos visitar uma das minhas "irmas" e seu esposo - Lynn e Wes - e para que Daniel fosse pescar, e claro. Pelo fato de existirem tantos lagos esta regiao e repleta de resorts e pequenas cidades que oferecem hospedagem e todo tipo de esporte aquatico. Nesta regiao os principais lagos sao o Rainy, Orr, Kabetogama e o Rainy River que oferecem otima pescaria. Tambem aqui fica o unico parque nacional do estado - Voyageurs National Park - que e uma ilha de 218.000 acres com todo tipo de vida selvagem caracteristica desta area, incluindo "black bear". Um verdadeiro paraiso para os amantes da Natureza...O nome do Parque se deriva dos "viajantes" que trilhavam os caminhos lacustres em suas canoas feitas de casca de arvore trazendo mercadorias para esta regiao, trocando-as por peles a serem levadas para a Europa. 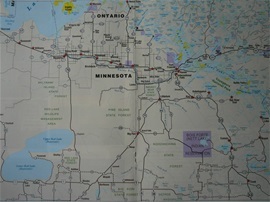 After leaving Ron and Marlys' place we headed north to the border of Iowa and Minnesota. Called "Land of 10,000 Lakes" - in fact the actual count is 11.842 lakes...so this is "the" place to go fishing!!! We are in International Falls, border town to Fort Frances, Ontario, Canada and it is called "The icebox of the US" due to the low winter temperatures. This past winter they have had 85 days with temperatures below 0 degrees Farenheit...piles of snow...but they do go fishing at this time of the year,too. We came to visit one of my AFS host sisters Lynn and her husband Wes, and so Wes would take Daniel fishing and he has had a good time. This region has a great number of good fishing lakes and so there are several resorts around here where one can spend sometime practicing all kinds of outdoor sports. The main lakes here are the Rainy, Orr, Kabetogama, Crane, and Rainy River - all of which provide for good fishing experiences. Here also lies the only National Park of the State - Voyageurs National Park - which is an island with 218.000 acres with diverse wild life, including the black bear. A real paradise for Nature lovers. Its name comes from the French-Canadian canoemen who travelled these waters in their birchbark canoes trading merchandise for fur.